Light emitting diode or better known as LEDs (LED), are electronic components that can produce light when an electric current flowing through it. 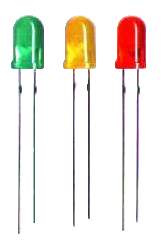 At the beginning LED is only made in red, but now the colors of yellow, green, blue, and orange are also available on the market. There is also an infrared LED, which produces infrared light. LED requires about 20 mA current to emit light with maximum brightness, although as small as 5 mA current can still produce visible light. An average voltage drop the LED is 1.5 V, thus the supply voltage is 2 V can turn most of LED with maximum brightness. With levels higher voltages, LEDs can be damaged and caught fire when a given forward voltage exceeds 2 V.
@ Sagar: Thank's 4 visit. I think 3 VDC is too much for supply voltage of LEDs, it will reduce a life time. For these case, put resistor in series with LED. Next I'll post about it. @Caang:Thank's for your reply on my blog. I love these LED`s. I always wish to work in LED`s.